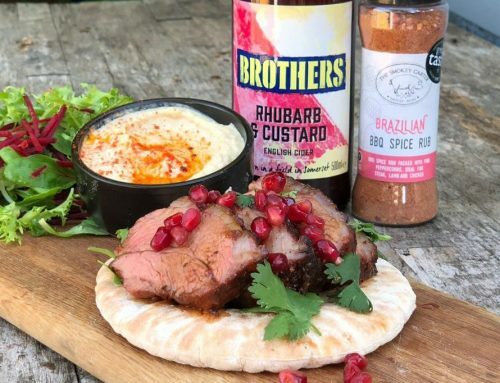 The guys at Brothers Cider loved the collaboration on our Brazilian Candied Lamb recipe so much they wanted more from The Smokey Carter! I had a few ideas up my sleeve and decided to get some ideas on paper (whilst sipping on a few ciders of course). Purely for research purposes…honest. At Smokey HQ we have three types of chilli Jam (Chipotle, Original and Scotch Bonnet). I’v come up with various flavours over the years but have never really had the chance to get labels designed and get them going. One that I have made was Rhubarb Chilli Jam and thought something along these lines could work nicely for my next cider collaboration. 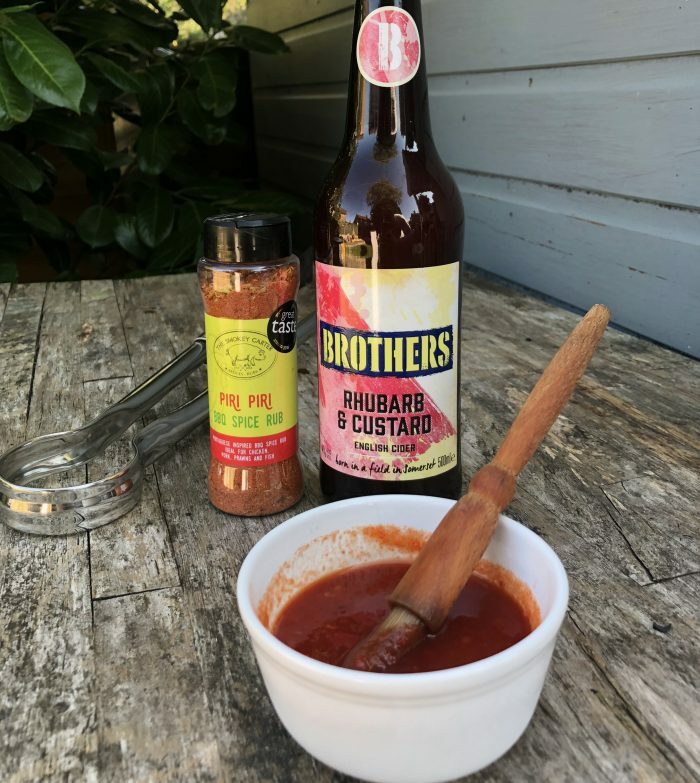 For this recipe I thought why not take our Sweet Original Chilli Jam and reduce it down with Brothers Rhubarb and Custard Cider to create a glaze. Read on for the full recipe. Trim off any unwanted bits from the chicken breast and cut into large 4cm chunks. Place in a zip lock bag and add in 2 tablespoons of Brothers Rhubarb and Custard Cider. Dust in our Piri Piri BBQ Rub and massage the chicken getting a nice even coating. Leave to marinade for an hour or two or overnight for the best results. Meanwhile, make the sweet chilli glaze. This can be in advance or even the day before. Add all the glaze ingredients into a pan and reduce until it reaches the consistency of a sweet chilli sauce. This should take around 10 minutes. Allow to cool and put in the fridge. 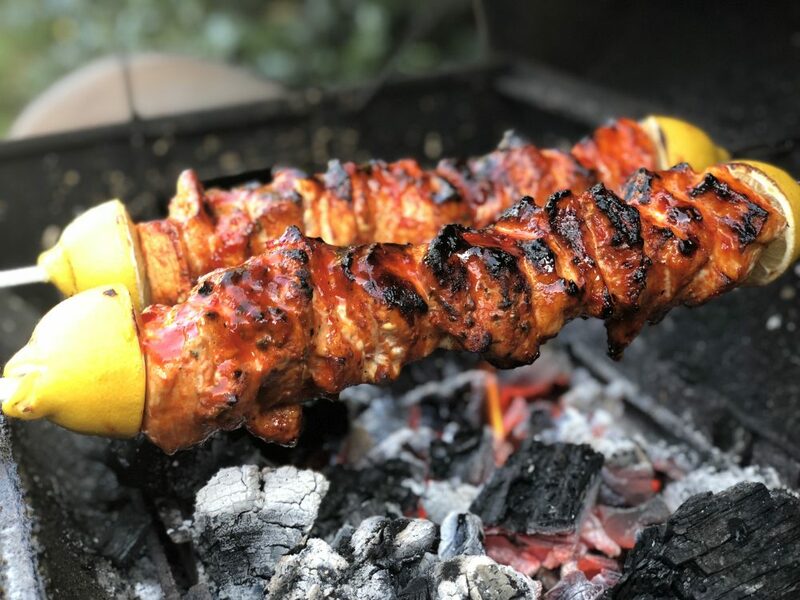 Take two large skewers, cut a lemon in half and slide each half down each skewer. This will hold the chicken in place and stop it from sliding further down the skewer. 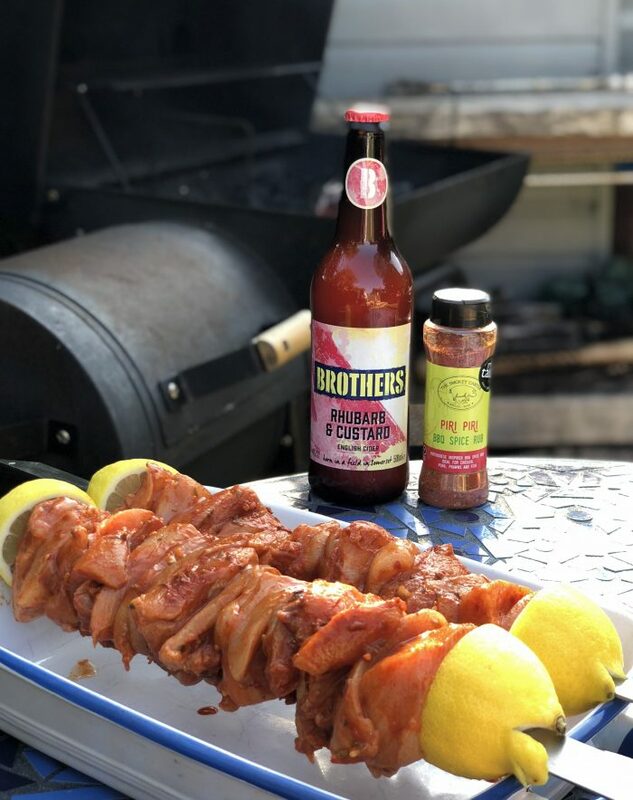 Split the chicken in two and load up each skewer. Finish by securing the meat in place with another piece of lemon. The skewers I got online are like swords and one skewer will be enough for two people. If you like you can cut the chicken into slightly smaller chunks and use four smaller wooden skewers. Don’t forget to soak the wooden skewers in water to prevent them burning on the barbecue. Our BBQ has a depth of around 30cm so I made sure I would get the maximum amount of meat on the skewer. 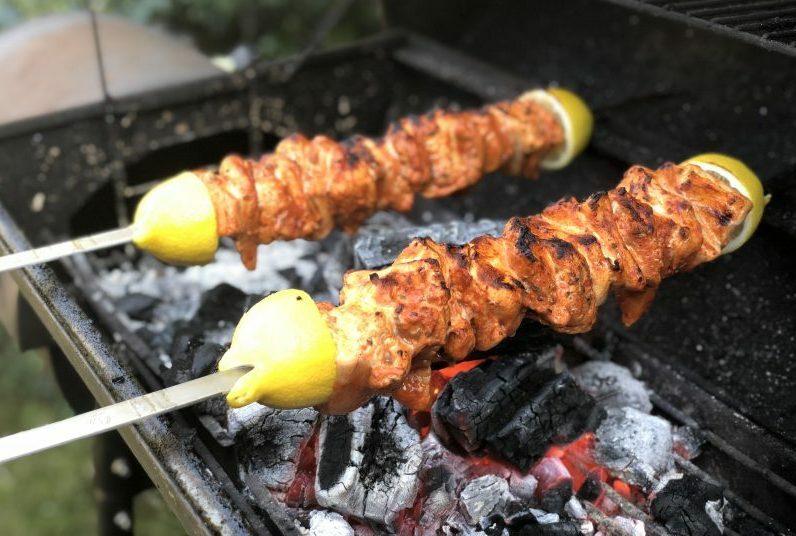 Rest the skewers over the barbecue edges so the chicken is directly over the hot coals. This gives it a nice even cook. If using smaller skewers place on the barbecue grill. Turn the chicken every few minutes. By the end, the lemons will have also cooked through and will be caramalised and juicy, perfect for squeezing and basting the chicken at the table. The chicken should take around 15-20 minutes over hot coals. We also had a cooler area with no coals underneath where we could close the lid whilst the chicken cooked through as they were fairly big chunks. For the last 5-10 minutes brush the chicken with the sweet chilli glaze. Turn regularly and brush with more glaze being careful not to let it burn too much. 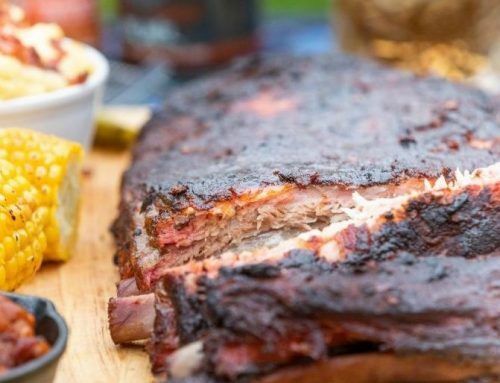 Build up a nice coating of sweet chilli glaze and serve. To ensure the chicken is cooked all the way through, the internal temperature should reach 165 degrees Fahrenheit (°F).